The Snake Pit, known over the years as the Enaville Resort, Josie's, Clark Hotel and many other names, has been a landmark for over 135 years. Located at the fork of the Coeur d'Alene river, the Snake Pit has served as a boomtown bar, railroad layover, hotel, house of ill repute and starting point for loggers and miners of yesteryear. 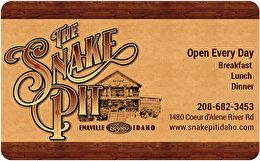 Today….the Snake Pit blends the new with the old in providing you with the finest….meeting old friends and new in the rustic atmosphere while enjoying your favorite food and drink. For balance inquiries call the phone number to a The Snake Pit's location below.